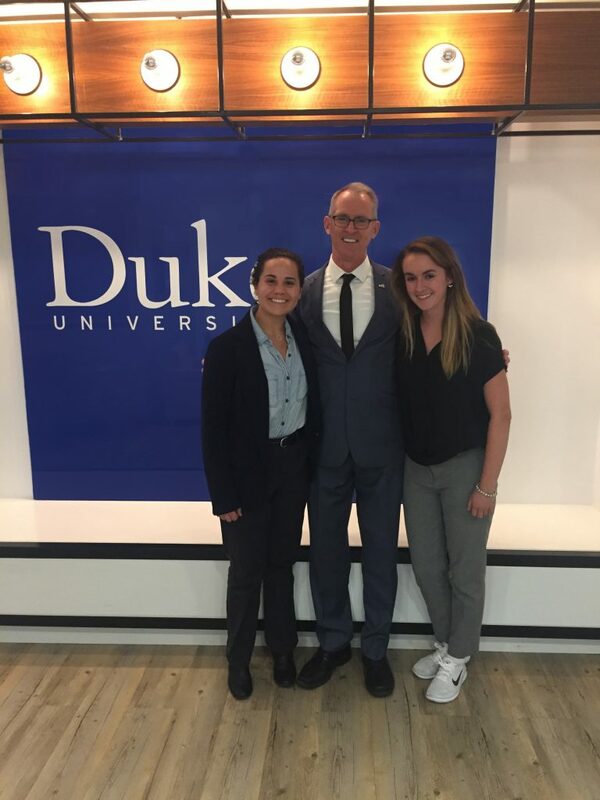 Gia Jadick (left) and Katie Ridgway, DukeEngage interns at the Niskanen Center, with former congressman Bob Inglis, who gave a talk to all the DukeEngage DC students on climate change and a carbon tax. This first week in Washington D.C. has been filled with experiences possible in no city other than our nation’s capital. I attended a meeting at the capitol, met a former congressman, and helped work on upcoming legislation. I am a climate policy intern at the Niskanen Center, an up-and-coming think tank working on promoting an open society. It’s exciting work, but I do feel a bit like a fish out of water. I come from a background in physics and political science, two areas heavily based in quantitative reasoning, formal logic, and theoretical arguments. The actual policy work is all new to me. So far, I have been playing catch up. I am focusing on learning the information on climate change necessary to succeed at the Niskanen Center. This involves investigating press releases from congressmen, books written by climate skeptics, reports from the Congressional Research Service, and a healthy variety of books, among other things. I’ve learned the pros and cons of all the main proposed solutions to climate change. The main three are rules and regulations, cap-and-trade markets, and carbon taxes. The Niskanen Center argues a carbon tax is the best way to reduce emissions. The gist of the argument is, if the price tag on carbon dioxide emissions is high, then companies will want to reduce their emissions—no regulations necessary. In this manner, price signals can’t fail. One aspect I have found particularly interesting about the carbon tax bills has been their math. The bills all include their own formula for greenhouse gas emission intensity. A minimum emission rate is necessary to qualify certain companies for taxation and exclude others, further incentivizing companies to lower their carbon emissions. My background in physics and mathematics led me to assume that such formulas should be the most straightforward aspect of these bills. However, I suppose when you have to write a formula using the English language instead of algebraic notation, things can get more convoluted than necessary. The most amusing part I found in these formulas was that they often included a seemingly random multiplicative constant. For example, in one bill I read, after calculating the ratio of greenhouse gas emissions to shipment value, the formula said to multiply that value by 20. Twenty? I was puzzled, until I realized that the qualifying percentage was 5%—or, 1/20. The constant was placed in the formula totally arbitrarily, just to scale up the greenhouse gas intensity threshold from 0.05 to 1. How amusing! I recognize that this is not amusing to most other people in my office. To a tenured policy maker, there is nothing unusual about a random multiplicative constant. The policy maker would probably argue that the constant simplifies the intensity threshold by scaling it up to 1. My own amusement serves as another piece of evidence indicating my amateurishness. Nevertheless, I wonder whether I will be able to advantageously utilize my mathematical background later on. There are clearly quantitative aspects to this work. It is just a matter of uncovering them as the summer progresses.